In Sales Cloud, when companies are dealing with Accounts, Contacts, Opportunities and Products, one thing is very obvious who the company will get the money back from the Contacts for the Products sold to them. Are the contact/account going to pay all together in one shot or are they going to pay over the period of times(Equal Installments)? Salesforce has the answer to these questions. In Salesforce you can configure how your customer will pay you the money. 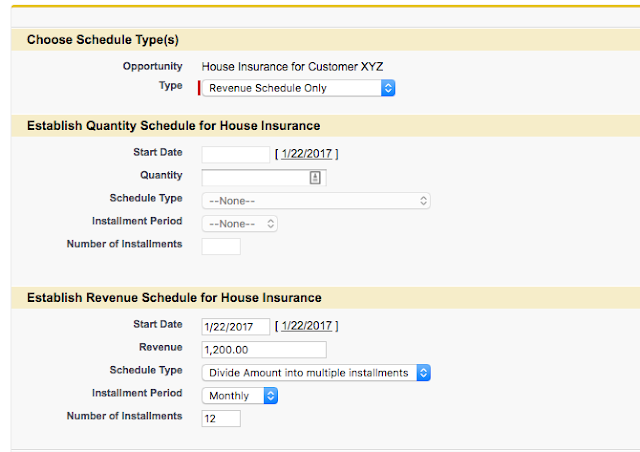 Based on that configuration, you can run your business reports to track your sales matrices. 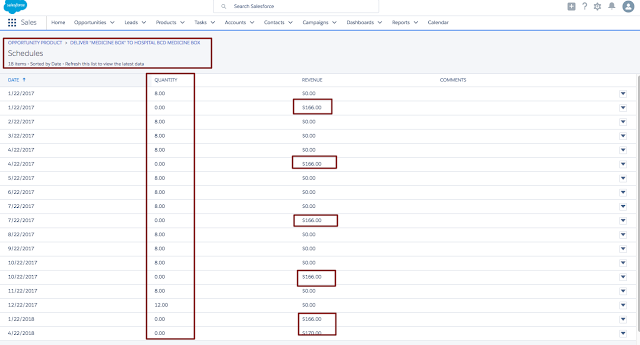 The way you can configure this in Salesforce is known as Product Schedule. Product Schedule are the payment or delivery cycles for the products which will be either paid over time or delivered over time. In Salesforce we have three different types of schedules. Quantity Schedule: Choose this schedule when you want your products to be delivered over the period of time. Example - Consider your customer bought subscription of one magazine from you for the next 2 years. Now you need to courier the monthly subscription to your customer every month. So in this scenario, you will go for Quantity Schedule. Revenue Schedule: Choose this schedule when you want your customer to be billed over the period of time. Example - Consider you are selling House Insurance to your customer. The total cost is USD 1200 for one year. But you will bill customer on monthly basis i.e. USD 100 per month. In this scenario, you will go for Revenue Schedule. Revenue and Quantity Schedule: Choose this schedule when a product will be delivered over the period of time and you bill your customer also over the time. Example - Consider your customer bought the subscription of one magazine for next 2 years. But this time instead of charging your customer at the beginning, you will charge the customer on monthly basis and also courier the magazine on monthly basis. In this scenario, you will go for Revenue and Quantity Schedule. Divide: Here the Unit Price is divided by the number of installments. Repeat: Here the Unit Price is multiplied by the number of installments. Product Schedule can be enabled from Setup > Customize > Products > Product Schedules Settings. 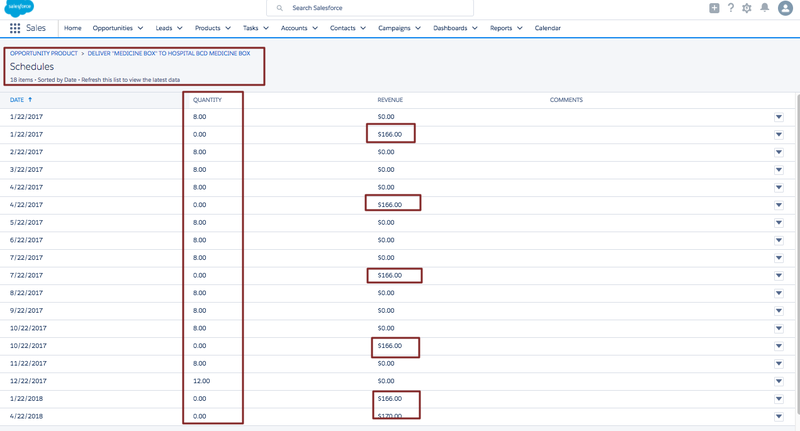 Note - Read this post from Salesforce on Consideration for using Product Schedules. A default schedule is associated with a product for a particular price book. Every time such product is added to the Opportunity, the default schedule is automatically added as well. 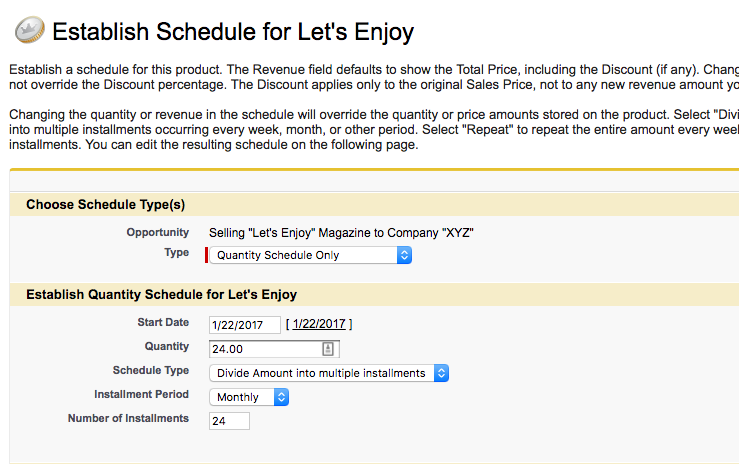 Even though default schedule is automatically added to the Opportunity, Sales Rep can still change the schedule. Let's go for some Use Cases. Company ABCD is selling subscription of their magazine - "Let's Enjoy". This magazine is getting published on monthly basis and cost of each publication is USD 10.00. Company ABCD is having customer who is planning to buy the subscription for next 2 years. Sales Rep of ABCD will now create the opportunity, add the product and product schedule as well. 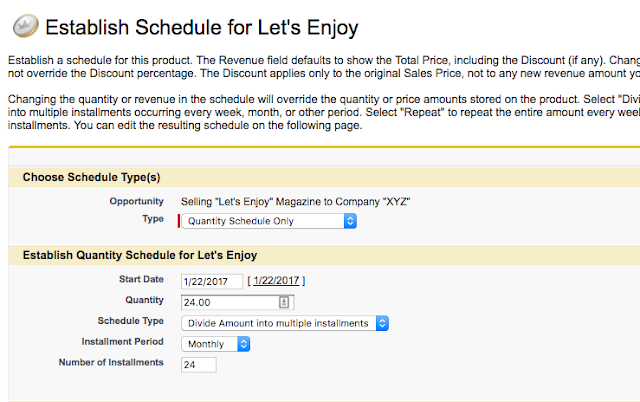 Assumption: Product "Let's Enjoy" is having no default schedule setup. 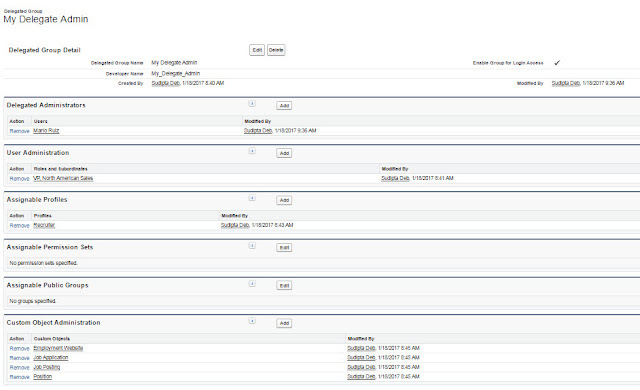 So now Quantity Schedule is configured in Salesforce. Company MNOP is selling "House Insurance". Cost of House Insurance is USD 1200 per year. Company wants to bill customer for this insurance on monthly basis. Sales Rep of MNOP will now create the opportunity, add the product and product schedule as well. So now Revenue Schedule is configured and the total amount i.e. USD 1200 is divided into 12 equal monthly payments i.e. USD 100.00. Note - If a product is having both default Quantity and Revenue Schedule, then Quantity Schedule is calculated first to determine the total product revenue. Then the Revenue Schedule is applied to the amount. I will explain this in my next Use Case. Company IJKL is selling Medicine Box (Cost is USD 10.00 per box) to hospital BCD. The quantity of Medicine Box is 1000. Company will deliver the boxes over the period of 12 months on monthly basis. Company will send the bill to hospital quarterly over the period of 6 installments. Sales Rep of IJKL will now create the opportunity, add the product and product schedule as well. As the above picture says, the quantity is distributed on monthly basis where the revenue is distributed on quarterly basis. 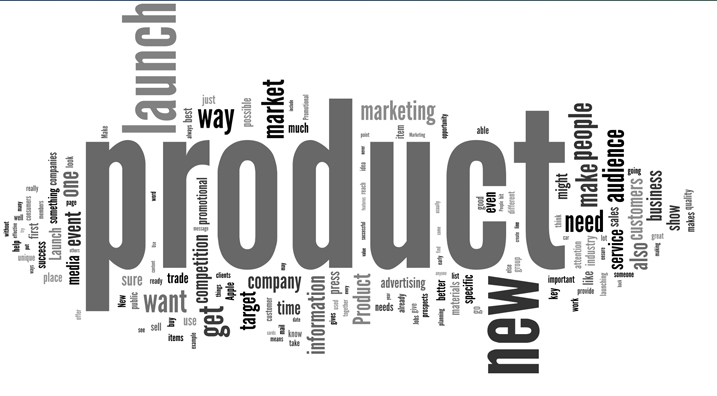 I hope with the above examples, the concept - Product Schedule will be easy for you to understand. Please provide your feedback. Thanks. In my previous post, I have explained the basic concepts about Products and PriceBooks. You can read the post here - Products and Price Books in Salesforce. Now in this post, I am going to explain the relationship between Product, Price Book and PricebookEntry. So let's start with few basics. Products are represented by Standard Object - Product2. Each Pricebook can have zero or more entries. Each of these entries are stored inside the Standard Object - PricebookEntry. Each entry in PricebookEntry defines the cost of the products in a particular currency. 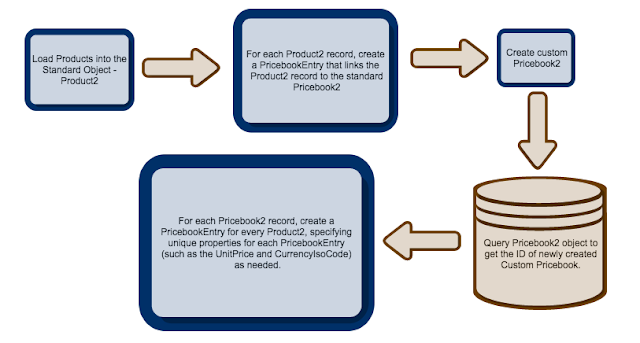 These three objects - Product2, Pricebook2 and PricebookEntry will only be available if Product is enabled in the organization. 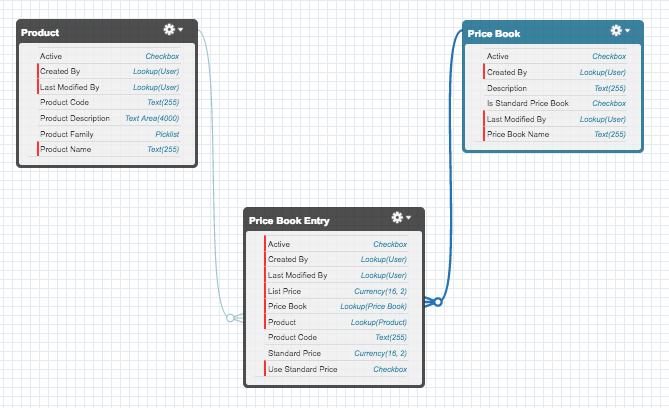 PricebookEntry is the junction object between Product and Price Book. OpportunityLineItem is the junction object between Opportunity and PricebookEntry. Below is the flow diagram depicting the process to load Products and setup PriceBook through API. I hope this post will help you to understand the relationships between these objects. Please provide your feedback. Thanks. A Product is a service or item that the company sells to the customers. Once you have added the Products, you can set the price of the product per unit based on your business. In Salesforce, Product is a Standard object having standard fields and tabs. You can add your custom fields to customize Product object as per your business requirement. Products can be added to the Opportunity allowing you to have an correct inventory and also make your forecasting accurate. The Price Book will provide the list of products and their prices per unit. You can create multiple price books to maintain different prices for the same product based on your business needs. Salesforce will always provide your a Standard Price Book. The moment you add a Product into Salesforce and set the price of the Product, that Product will go into Standard Price Book. But you can create Custom Price Book as well. Let's say, the company "Universal Company" is selling the product - "Desktop Mouse" globally. The company is running it's business from Canada. But company is selling products globally. Now when this company is selling "Desktop Mouse" within Canada, the price is USD 12.00, but when it is selling the same product in Europe, the price is USD 19.00 (due to extra shipping cost), similarly then the same product will be sold in APAC, the price will be USD 20.00. Now to maintain different prices for the same product based on geography, we need to create three different Custom Price Books - Canada Price Book, Europe Price Book and APAC Price Book. Don't worry, I will provide you the entire step by step configuration in later part of this post. Let's concentrate on the basic concepts and considerations while configuring Products and Price Books in Salesforce. Permission needed to create Products are "read" and "create" permission on Product object. You can create Products by cloning an existing Product. But if you don't have sharing access in any of the Price Books, then entries for that Price Book and Product combination will not be created. Similarly if you have read-only access on any fields, value of that field will not be carried over to the cloned record. It is recommended to not have more than 2,000,000 products otherwise it may impact the performance. Products always needs an active Price Book so that you can add the product to that Price Book. Product object is having a standard field - Product Currency. This field holds the currency of the product. In a multi currency organization, if the product currency is different from user's currency, then product currency will be converted into user's currency and both the values will be displayed. (Converted amount will be displayed in parentheses). Admin or user with with "Edit" permission on Price Book can share the same with more users, groups, roles and territories. You can't make it more restrictive. Sharing option will only be available when the OWD of Price Book is either "No Access" or "View Only". Price Book Sharing is not available under Salesforce Lightning Experience(Latest release is Spring'17 when I am writing this blog post). It is available only in Salesforce Classic. 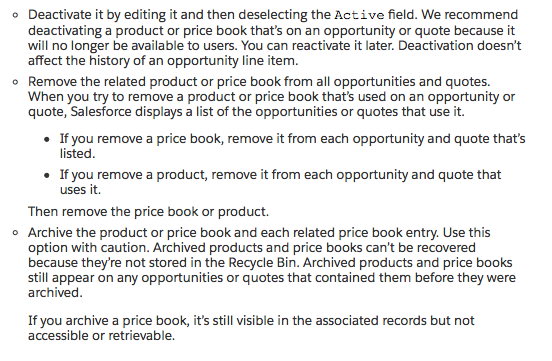 You can delete, deactivate or archive Custom Price Books. It is having no impact on other Custom Price Books. These action will impact Opportunity and Quotes. You need to change association with Opportunity or Quotes before removing an associated Price Book. For Standard Price Book, you can deactivate the same, but can't delete or achieve it. You can't delete a Price Book while it's in use on Opportunities or Quotes. Trying to do the same will create a list of Opportunities or Quotes where the Price Book is being used. You can deactivate a Price Book while it is being used in Opportunities or Quotes. Managing Entries is also possible for deactivated Price Books and you can re-activate the same as well. You can archive a Price Book even if it being used in Opportunities or Quotes. Archived or Deleted Price Books can't be recovered. Want to remove Products from Price Books? You can remove Products from a Price Book as long as that Price Book + Product combination is not being used in any existing Opportunity or Quotes. Removing Products from a Price Book will not impact other Price Books where the same Products are listed as well. Important Note - While associating Products with an Opportunity, you need to select the Price Book first. An Opportunity can have Products only from one Price Book. In my next post, I will explain the relationship between Price Book, Product and PricebookEntry. Please let me know your feedback. Thanks. In a big organization, a single admin can a big problem in terms of bandwidth issues. Normally admins are getting multiple requests like - creating users, updating profiles, resetting the password, running report etc. along with their daily meetings. So it will be really difficult for a single admin to handle all these requests by himself/herself. And that is the place where admins want to delegate some of their work to others (trusted colleagues). But trust me, it is a big decision. You should not give all the admin privilege to your colleagues even though he/she is a very trusted employee. Rather you should delegate few specific task to your colleagues. 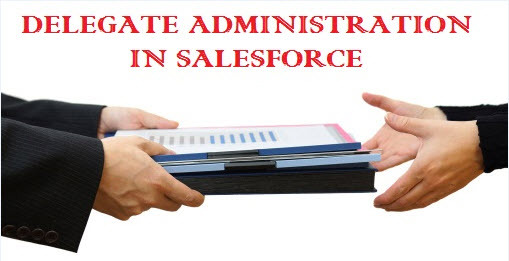 In Salesforce, we can do the same with DELEGATE ADMINISTRATION. 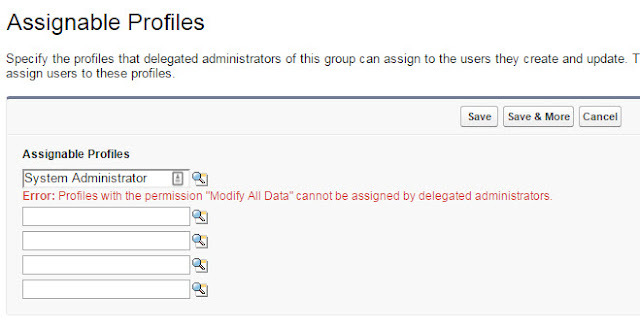 So basically Delegate Administrator will allow named users to manage other users within selected roles and profiles, as well as managed selected custom objects. Role & Subordinate: Delegate Administrator can create and edit users with specific roles and subordinates. The can't modify the role hierarchy though. Profile: Delegate Administrator can assign users(they create or edit) to assigned profiles. They can't modify the profile. Permission Set: Delegate Administrator can add/remove selected permission sets from users(they create or edit) to assigned profiles. They can't modify the permission set. Public Group: Delegate Administrator can add/remove selected public groups from users(they create or edit) to assigned profiles. They can't modify the public group. Custom Object: Delegate Administrator can manage every aspect of the selected custom objects except object's permission on profiles. Delegate Admin can't create or modify relationship on the objects or set org-side sharing defaults. Enable Login Access: Delegate Administrator can login in as a user belonging to the role hierarchy that they manage. To make an existing user as "Delegate Administrator", you need "Customize Application" Permission and that user need "View Setup and Configuration" permission. Note - "View Setup and Configuration" permission is always a tricky one as it will open up many more permissions to the users. So before giving this permission to any user, you should think multiple times and justify yourself. Giving "View Setup and Configuration" permission to a user so that you can mark that user as Delegate Admin should NOT be the correct approach. I will highly recommend you to read the post - "Become More Efficient With Delegated Administrators" from AdminHero. I have two users in my Org - Administrator (Sudipta Deb) and Non-Administrator(Mario Ruiz). I want to mark Mario as Delegate Administrator so that he can take care of creating/editing users with Profile - "Recruiter" or with the role - "VP, North America Sales". At the same time, I would like to make sure he can take some of the request related to custom objects - Position, Job Application, Employment Website, Job Posting. Open Delegate Administration: Click on Setup | Administer | Security Controls | Delegate Administration. Add the user "Mario Ruiz" under "Delegated Administrator"
Can't assign profiles or permission sets with "Modify All Data" permission. The -None- option will not be available when selecting roles for new users. For formula fields, accessing merge fields from another object requires delegate admin's permission on that object. For security, profiles with the “Modify All Data” permission cannot be included under "Assignable Profiles". See the error when attempting to include the System Administrator profile. Delegate Admin can change the FLS for existing and newly created fields for those objects which are assigned to him/her. But Delegate Admin can't change the Object Level Permission on Profile. Are you using Delegate Administrator in your org? What use case you are handling using Delegate Administrator? What problem(if any) you faced? Please share your feedback.